Laura understands the many struggles and sensitivities financial planning can bring about to women and their families. Her goal is to makes sure the client's voice is heard, and all perspectives are taken into consideration when going through the financial planning process. Our team offers a warm and welcoming environment to all clients. We believe that having that respect and voice is critical to the process. Laura and her team naturally treat clients like family. They enjoy talking to their clients and getting to know their life stories. It helps them build deeper relationships that last throughout the years. "Our clients know they can confide in us about anything," Laura notes. "They also know we’ll tell them the truth, good news or bad." 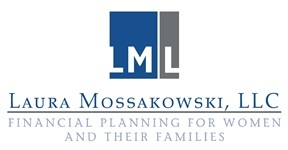 At Laura Mossakowski, LLC, you’ll work with experienced and caring professionals who will listen to and understand your concerns, show you how to organize and invest your money wisely, and give you all the support and guidance you need to take control of your finances – and your life.